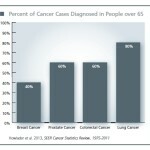 A woman's risk of breast cancer increases with age--about 80% of breast cancer cases occur in women over the age 50. Silver BookA woman’s risk of breast cancer increases with age–about 80% of breast cancer cases occur in women over the age 50. A woman’s risk of breast cancer increases with age–about 80% of breast cancer cases occur in women over the age 50.